Ryan Moore hasn’t gotten to race much this fall. He had to sit out the Busch North season finale at Thompson after a NASCAR penalty for roughhousing at Lime Rock. He’s also had to endure a round of rumors that he was finished in his role as a member of the Dale Earnhardt, Inc. driver development program. Where the rumors got started, it’s hard to say but the fact remains that Moore will be racing for the team in this weekend’s Busch Series event at Homestead-Miami Speedway. Last week, Moore tested in preparation for that event. It was all part of a very busy week that ended with a third-place finish in the Toyota All-Star Showdown at Irwindale Speedway. Moore has been busy, but he wouldn’t choose to do anything else. Peter Daniels has had quite a career in cars with fenders, having been a regular in the NASCAR Busch Series, and in cars without fenders, with a long list of accomplishments in Modified racecars. He was the 2002 NASCAR Weekly Racing Series champion based on his performance in one at Claremont (NH) Speedway. Now, Daniels is hanging it up. After two seasons of competition in the True Value Modified Racing Series, Daniels has announced his retirement as a driver. Daniels finished second in the 2005 TVMRS point standings as is going out near the top of his game. One of the strongest secondary divisions in New England got their moment in the sun two weeks ago at Concord Motorsport Park as the SK Modified took part in the North vs. South Shootout at the track. models at Stafford contacted me and asked if I needed some help and they wanted to buy me a car and take care of everything. Pitkat was asked what his plans were for 2006. 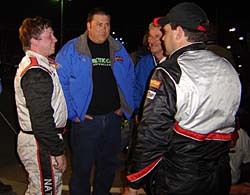 Woody Pitkat from Stafford Motor Speedway was one of the SK cars here from the north for the first north South SK race. Woody drove the number 52 SK weekly at Stafford. 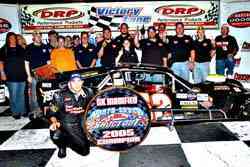 Andy Seuss has been voted by fans as the 2005 True Value Modified Racing Series Most Popular Driver. He was announced as the winner at last weekend’s banquet for the tour in White River Junction, Vermont. WHY WAS THERE SO MUCH WRECKING IN IRWINDALE? Rip Michels couldn’t be further from the Northeast as a resident of California and regular in the NASCAR Southwest Series. But he did have some insight on why so many drivers wrecked in last weekend’s NASCAR Toyota All-Star Showdown, which included many drivers from the NASCAR Busch North Series loading up some pretty mangled racecars.